Along Came Poppy: 366 Books in 366 Days: A book for BREXIT? 366 Books in 366 Days: A book for BREXIT? The events of the past two weeks have left me, like so many, stunned and extremely saddened. The country's decision to leave the EU certainly surprised me, but the sudden and dramatic outpouring of intolerance has truly upset me. I firmly believe, in time, we will be able to make things work for our country. We simply have to. My real concern is what the UK will look like for our youngest generation. Can we protect our children from the current negative rhetoric? Will they be allowed to grow up knowing and celebrating the beauty of diversity? I really do hope so. 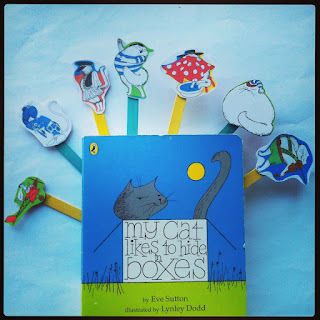 cats who sing and fly and dance..."
This is taken from my favourite childhood picture book, "My Cat Likes to Hide in Boxes" by Eve Sutton. It seems very appropriate to share this one with you now as it subtly champions diversity. 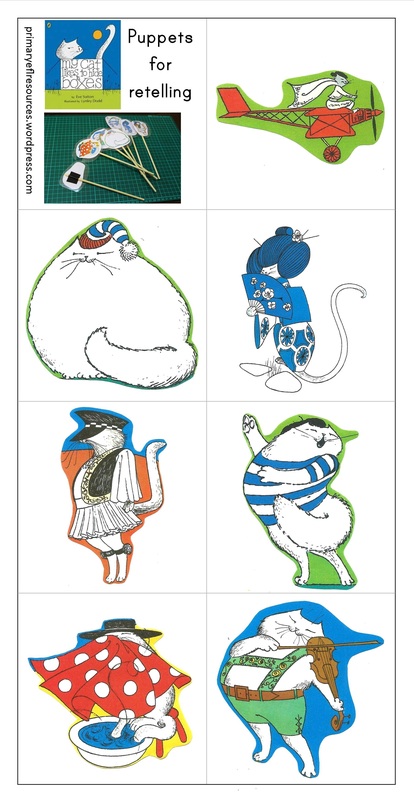 The book celebrates individuality by featuring cats from all over the world and highlights their special talents. The simple rhymes together with strong rhythm and lots of repetition make this a fantastic book for young children. It is very easy to join in with and will help build language skills. The illustrations are by Lynley Dodd, who is better known as the creator of the infamous Hairy Maclary. Dodd's pictures are bright, bold and highly stylised. Each cat is portrayed doing their special skill and, in most cases, wearing some element of national costume. With pictures that delight and text to chant out loud, this is a one to read over and over again. In our house this is a very special book. Three generations know it inside out, back to front and upside down! We have lots of fun acting out the story. For example pretending to be a plane, sneezing or waving a fan. Puppets or props could also be used. 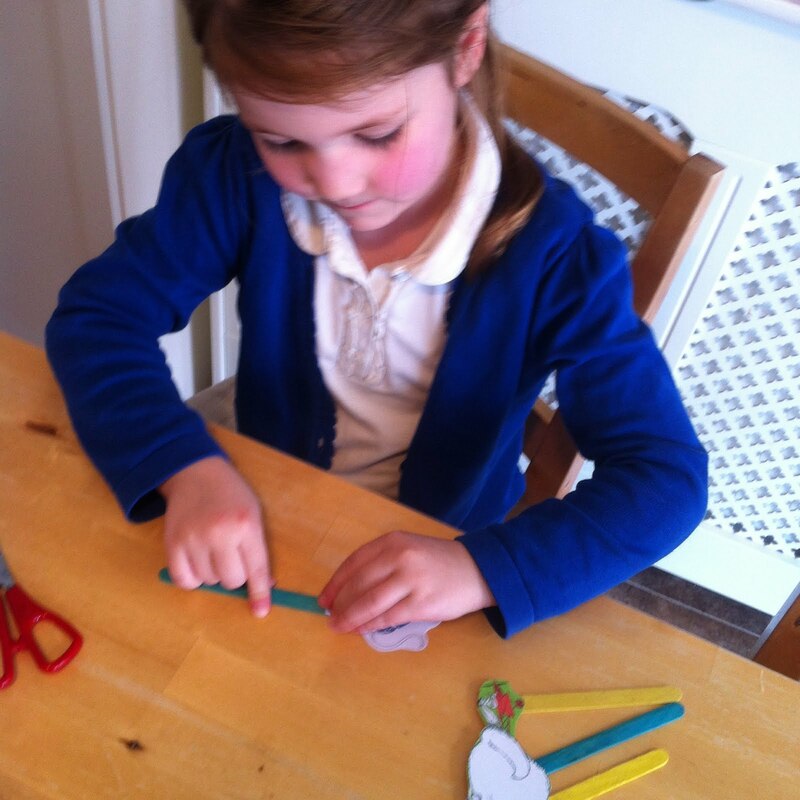 We recently made these simple puppets using the images from this link. Also, inspired by the story, we have created hiding "pop up" cats. 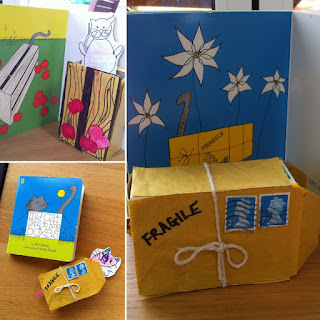 Firstly, we drew our own cat picture on paper making sure it would fit inside the small box. Then we cut out the picture, glued it on the card and stuck it to a lollipop stick using tape. Next we decorated the small boxes to look like the boxes in the story. 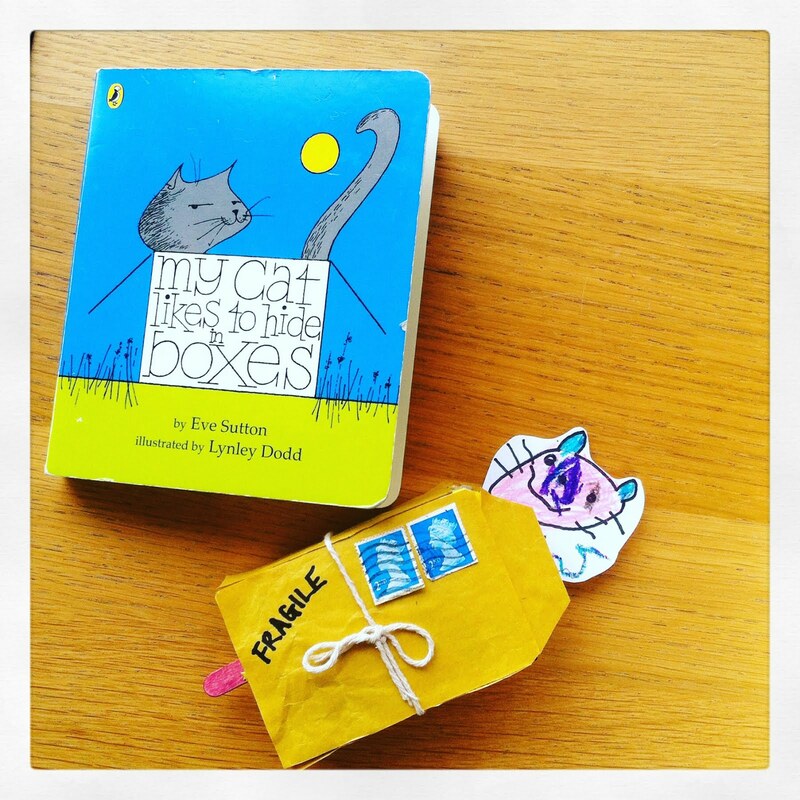 Finally we cut a hole in the bottom of each box and inserted the lollipop stick through the hole so the cat was hidden inside the box. By pushing the stick up, the cat jumps in and out of the box. They were extremely simple to make and a huge success with all three mini reviewers. We are interested in reading other books celebrating diversity. I wonder how many St Edwards children remember this one? I should say adults, they will be now. An absolute classic and to think, for our family it began with a discarded library book! This was the first picture book that my daughter ever read on her own :) I must dig out our copy, we haven't read it for ages! This is such a lovely post, diverse books are so important for our children and even more so now. I love all your activities and how wonderful that three generations of your family love this book! Aw thank you, so pleased you liked it and yes diverse books can do so much! Thank you for your comments :) f you do decide to read the book, please let me know what you think! I discovered this books on the back of Hairy McLary when my kids were small and we loved /love it too (though I have to say, we never did any of the amazing crafts you have put with it) - yes, definitely a good choice to demonstrate the appallingness of Brexit! Thank you for sharing with #diversekidlit and I am very happy to have discovered your blog.